BANGI, 7 June 2012 – Education Specialist, Dr Maya Kassandra Soetoro-Ng, a half-sister of US President Barrack Obama, has proposed an exchange of teaching staff between The University of Hawaii, where she teaches and The National University of Malaysia (UKM). Dr Maya Kassandra, who is an assistant professor of education, said such an exchange will broaden the horizons of the respective institutions. She visited UKM’s PERMATApintar®, the National Gifted Centre, today as part of a four member delegation from the East-West Center (EWC) of Hawaii now on a visit to Malaysia until June 11. Other members of the delegation are the Centre’s President, Dr Charles Morrison; Board Member, Puongpun Sananikone and the Director for its Education Programme, Dr Terrence Bigalke. They were welcomed by UKM Vice-Chancellor, Prof Tan Sri Dato’ Wira Dr Sharifah Hapsah Syed Hasan Shahabudin. The delegation was briefed on PERMATApintar’s activities to nurture young precocious talents. Dr Maya Kassandra suggested that UKM lecturers explain to Americans about the Islamic World, something that her compatriots don’t know enough of. She in turn would lobby for more funds from the US Government for EWC to carry out student and teacher exchanges with Malaysia. The East-West Center in Honolulu, Hawaii aims at promoting better relations and understanding among the nations and peoples of Asia, the Pacific region and the United States through cooperative study, research and dialogue. Dr Morrison said there were at least five Malaysian students who had graduated from UKM undergoing various courses in the United States, through the good offices of the EWC. Three are at Stanford University in California, the University of Wisconsin and Brown University in Indiana,. 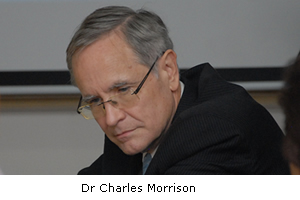 Dr Morrison said he did not see why students from PERMATApintar would not be able to follow the same path. 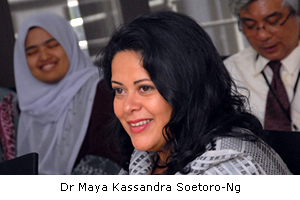 Dr Maya Kassandra was born in Jakarta, Indonesia and is the maternal half-sister of President Obama. Her father is Javanese, while Obama’s is Kenyan. While living in Indonesia, she was home schooled by her mother, Anne Dunham and then attended the Jakarta International School from 1981 to 1984. Like her older half-brother Obama, Dr Maya Kassandra returned to Hawaii where she continued her high school education graduating in 1988. She is an alumna of Barnard College in Manhattan, New York. She received her master’s degree in secondary language studies and English from New York University and a PhD in international comparative education from the University of Hawaii. A statement from the Institute of Strategic and International Studies (ISIS) Malaysia said Dr Maya Kassandra and delegation is scheduled to call on Prime Minister, Datuk Seri Najib Tun Razak, Datin Seri Rosmah Mansor and Deputy Prime Minister, Tan Sri Muhyiddin Yassin. Dr Maya Kassandra is also due to launch a collection of 20 Indonesian batik pieces belonging to her late mother at the Islamic Arts Museum. She and her delegation’s visit is organised by the EWC and hosted by ISIS Malaysia in cooperation with Tun Daim Zainuddin’s office and the embassy of the United States in Kuala Lumpur. In 2009 Dr Maya Kassandra helped brought her mother’s dissertation to publication in the form of the book Surviving against the Odds: Village Industry in Indonesia.